There are many different chemical protective suits commercially available. Faced with a bewildering choice – and the complexity of the certification information – what criteria could be used to select the right protective clothing? A short summary of the European Standards for chemical protective clothing and a chemical protective clothing selection guide is provided to assist you in this task. The European PPE (Personal Protective Equipment) directive 89/686/EEC refers to “categories of PPE”. Chemical protective clothing must be CE certified as Category III PPE. Such clothing meets the minimum performance requirements of the specific product standard, is identified with a “CE mark” followed by the 4 digit code of the notified body and receives a “CE certificate” (EC-Type examination certificate according to article 10 of the PPE directive). In addition to this initial CE certificate, the manufacturer needs to ensure the product continues to conform and meet the original certification performance claims. The manufacturer is obliged to have a quality assurance program to ensure ongoing compliance with the certification claims. Unlike Category I and II PPE, Category III PPE must additionally be subject to an annual audit by a notified body, who certifies the PPE continues to comply with the CE certification claims. In simple terms, “third party confirmation that the CE certificate of the product is still valid”. This is known as the “Quality Surveillance certificate” according to article 11 of the PPE directive. 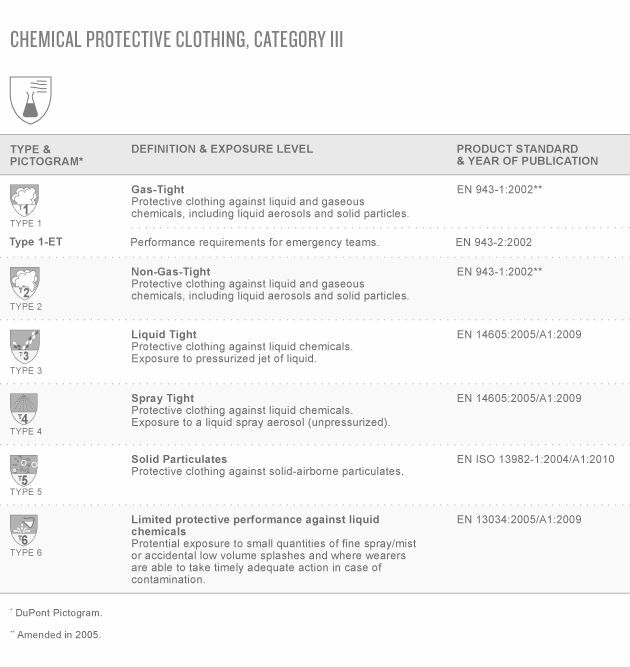 To facilitate the selection of Category III Chemical Protective Clothing, the European Union has defined harmonized European product standards for six levels of protection (“types”). Each “type” is associated essentially with a “level of exposure”. The European standard for each “type” also specifies some minimum performance requirements, known as performance classes, for the constituent fabrics, seams and in some instances components. For users who seek customised assistance with garment selection, DuPont can offer an extensive personalized technical service. The Techline service is available to answer technical questions regarding protective clothing. Our technicians manage a comprehensive database on physical properties, chemical permeation and penetration data on the materials used in Tyvek® and Tychem® coveralls. Are you wearing the right protective garment for your needs? Click here to learn more.